I think the *blues* of summer are the best *blues* around. My girls are home. They had a wonderful time in Hawaii. It's a busy summer, but we're enjoying it around here. I hope you are too. Thank you so much for all of the anniversary wishes for my parents. They were touched by your thoughtfulness. It looks like real summer to me, and I wish I was there! How great to have your girls back with you! Isn't the spectrum of blues amazing? Great photo!! Love all the blues in creation! We're having an amazing summer! 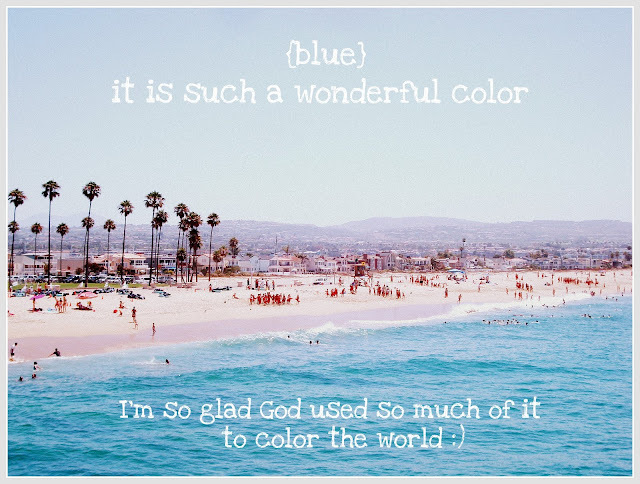 I love the Summer blues too:) I can't wait to hear more about the Hawaii trip! Enjoy your day my friend! HUGS! Enjoy the blue in your day. Have a beautiful day, my friend! Just lovely! I am so glad you are having such a nice summer. I agree it has been so nice. The pic of the sea is an amazing shade of blue! We had a great day at the beach - such a lift! Wow! A trip to Hawaii - I'm sure your girls loved it! There's nothing like the beach, and Hawaii's beaches are particularly wonderful. Blue has always been my favorite color...I'm loving the aquas now too! great photos! I was thinking of your girls last night and wondering if they were home yet. Your photo is so pretty! I'm glad you're having a nice summer. I love all the different shades of blue from cobalt blue to aqua. It's my favorite color. Take care. I love blue too, Marcia! It would probably be second to red. I know the girls must have had a wonderful time in Hawaii! Hope you all are having a wonderful summer too! Blue is my favorite color too! I'm glad your girls are back home again, and you are all enjoying your summer. ohhhh i agree!!! He did use it a lot! SO pretty and fresh. What a great picture. Love the beach and feel so cool looking at this. Have a great week! Thanks for swinging by my place. What a happy picture you've posted here. There's nothing like going to the beach on a lovely Summer day!!! Love the peacefulness of blue! Glad your girls had a wonderful time! The beautiful campsite we went to is in the California Sierra's its called Pinecrest Lake. There is also an overflow campsite called meadowview. We love it there. How exciting that you were able to visit Hawaii! it is a very amazing place to see...:) SOOOO gorgeous!! Happy Belated anniversary to your Mom and Dad! Congratulations to them, and you!! That is such a blessing! I hope you enjoy the rest of your Summer, sweet friend. It is amazing to me how many different shades there are of blue. It is an awesome color. I like your photo very much! You know, Brazil is a tropical country, very hot, but we're freezing in the winter and, because neither it snows in St. Paul ... miss the heat. I'll be in Orlando, FL on 08/27 and will be the end of summer, I love it! Have a day of bliss! Blue, blue, amazing blue. And so many and varied shades of it too. Pretty photo! Glad you had a wonderful summer!